We encourage users to include as much address related information on their upload file as possible, including: Input ID, Address ID, Address 2, and Postal Code. These fields should be populated and have the appropriate headers. If your file contains ONLY company names and company addresses, please make sure that company name is located in the Last Name Field. You should create a first and last name field in your file. Leave the First Name field blank and place all company names in the last name field. Then, upload your file to our app, and map your First and Last Name fields to the system’s First Name and Last Name fields. If your file contains BOTH individual and company names and addresses, please make sure that company name is located in the Last Name Field. You should create a first and last name field in your file. Leave the First Name field blank and place all company names in the last name field. Then, upload your file to our app, and map your First and Last Name fields to the system’s First Name and Last Name fields. TrueNCOA requires Address 1 to be included in the input file. Without this field, your file may not run! Address 1 should contain the main address information on a constituent; this includes house number and street name. Apartment or Unit numbers can also be included, but we recommend adding those to an Address 2 field. Please Note: If you have Care of (c/o) fields or company names located in the Address 1 field, we encourage you to move these to a separate field. Sometimes these extra address details shift the actual address to Address 2, therefore causing the system to read it incorrectly. If you have company name, read the First Name and Last Name (or Full Name) section above. City, State, and Postal Code should all have their own fields. TrueNCOA requires city level location to be included in the input file. This city level location can be given by either supplying City and State (2 fields), Postal Code (1 field), or City and State and Postal Code (3 fields). 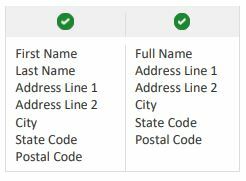 We recommend giving all three city level location fields to help the USPS find the correct address, but some errors could still occur. If you decide to map all three fields, each record should have City, State, and Postal Code data included. Meaning every field has data in it. Some users may benefit from only mapping City, State. Whereas others may benefit more from only mapping Postal Code. Users may run their file several times (for FREE) and can review the TrueNCOA Report to decide which file they would prefer to download. Sometimes when Postal Codes start with zeros, Excel drops the zeros even when formatted correctly. To resolve this issue, update your records with Postal Codes starting with zero to have a single quote. (Example: ‘00123). If you have City and State listed on your file, feel free to map City and State instead of Postal Code. City and State are acceptable locations for the USPS NCOA process. Additionally, using a CSV or TXT file will help you to avoid this issue all-together. If your file contains data fields that aren't required for NCOA that's ok. You can skip that field during mapping by leaving the dropdown blank. However, if you need that data returned on the export, you can use the Pass-Through field mapping option to retain those fields through the process. If you don't see the Pass-Through option, just click the toggle fields button to change your view. As an example, if it's important for you to have a constituent's phone number on your export, you could map phone number to Pass-Through, and the phone number you provided will be on your records in the export file. A Comma-Separated Value (CSV) File is a simple file format used to store tabular data, such as a spreadsheet or database, created by adding commas to separate the data. View a CSV file. CSV files can be created in Excel by saving the table and changing the 'Save as Type' to CSV (Comma Delimited). A Tab Delimited File is a simple text format for storing data in a tabular structure, such as a spreadsheet or database, created by adding tabs between data fields. View a Tab Delimited file. Tab Delimited files can be created in Excel by saving the table and changing the 'Save as Type' to Text (tab delimited). An Excel File is known as the Binary Interchange File Format (BIFF). Data inside all Office Document files are stored in series of fixed-size streams. All the data is contained in records that have headers, which give the record type and length. View an XLS File. You can review our full input file guide here.